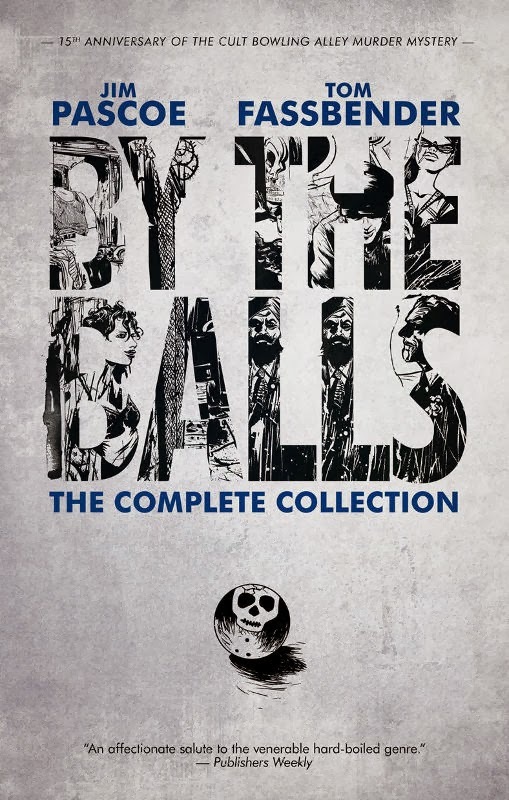 By the Balls: The Complete Collection consists of ten short stories—five stand alones and the five that make up 1999’s Five Shots and a Funeral—and the novel By the Balls. The stories follow the career of Ben Drake, a firefighter turned PI, and his entanglements with the underworld of Testacy City, Nevada. As far as PIs go, Drake is mild-mannered. He has little of Marlowe’s coolness, Hammer’s brutality, or the Continental Op’s cunning. Ben Drake is in fact remarkably average—other than his alcoholism, of course. And he is also a broken man, haunted by the death of his wife. In fact, most women in Drake’s life seem to meet unfortunate ends. But maybe these things make him more average. Drake’s average Joe persona stands in stark contrast to the comic otherworldliness of Testacy City. Otherworldly if you’ve never traveled through Nevada outside of Vegas, or at least been to Reno. Testacy City is Reno’s evil twin. For one thing, gambling hasn't taken a foothold here, mainly because the city’s thriving criminal community wants to keep it that way. Pascoe and Fassbender created a subtly odd cast of gangsters and crooks, noteworthy since they did it in the nineties when all fictional criminals were required to have some quirk or specific neuroses. The authors choose a more subdued approach compared to their contemporaries. A very large thug wearing an even larger suit. His diminutive yet deadly partner. Their boss, Small-Tooth Kelly. There’s nothing overtly odd about them: they don’t speak in outdated slang, or quote Chaucer prior to dispensing with a beating. If anything, they’re closer to the stock characters of classic hardboiled fiction than the hipster criminals of the nineties. The city too feels like a stock character of old school noir, replete with debonair mod bosses and drug-running Senate candidates. All of this could have gone wrong. The very fact that the stories center on a private investigator should have doomed the whole Ben Drake venture from the start. But Pascoe and Fassbender, though obviously referencing the classics, do so in a carefully self-referential way. Their absurdist and counterintuitive treatment of genre themes—Drake’s almost pathologically platonic treatment of women, for example—lighten the stories. Though By the Balls is tongue-in-cheek, the stories never stray into parody. The authors' background in comics may also have influenced their skillfully subdued yet cartoonish take on the hardboiled genre. The stories themselves are almost comedic in their setups. Though some of the stories felt unnecessary, particularly those providing background on central characters in the series (“Fireproof,” “Partners,” “Across the Line”), they were for the most part fun, often madcap narratives based on absorb premises. In this regard, “The Silent Ventriloquist” (case one from the generally good Five Shots and a Funeral) stands out. (I googled “Orpheus” and “Alexander Graham Bell" after reading it.) The centerpiece of this collection is By the Balls, wisely positioned in the last half of the collection. The novel is far superior to the short stories that make up the rest of the volume. It sticks with the basic absurdist and madcap nature of the shorter pieces, but as a short novel this approach is particularly effective. Finally, Akashic’s By the Balls: The Complete Collection gets bonus points for including Paul Pope’s artwork. Actually, I will give them two points on this. One bonus point because I am a fan of Paul Pope. And a second point for the mere inclusion of artwork. I have always found it odd that novels don’t include artwork more often. Who doesn't like pictures? AiIP: Is Self-Publishing Worth It?